Located at the southern tip of Orange County lies a beautiful "Spanish Village by the Sea." San Clemente was founded in the 1920s by Ole Hanson, who said "I envision a place where people can live together more pleasantly than in any other place in America." Today, Hanson's idyllic vision of San Clemente is conveniently located in the middle of the coastal stretch between San Diego and Los Angeles while the community's many ocean view properties peacefully reside among gently sloping hillsides. Welcome to " Villa Mare" where the Pacific Ocean meets this stunning architectural masterpiece. It is modern living by the sea at its finest with expansive ocean,islands and white water views. Entering the front courtyard yard with wrought iron gates, you will experience beautiful slate patios , fountains and ocean views. The exquisite entry has marble floors, custom brass stair railings, two story ceilings and ocean views. Brand new & under construction, you’ve got to experience this: step through your entryway, feel the cooling ocean breeze, and breathe deep. It’s the ocean air. From the moment you walk outside, through the 30 feet wide stacking Great Room doors, with no home located directly behind you, you realize you are sitting atop a Coastal nature preserve, with the sounds of Nature, and enjoying the commanding expanse of the Pacific surrounding you. The conveniences of metropolitan Southern California are omnipresent in San Clemente, but they are also balanced with the fresh ocean air in this sun-drenched beach town. San Clemente houses offer a variety of homes for sale, ranging from charming seaside beach houses to the artfully planned community of Talega. At the south end of town is the entrance to Marine Corps base Camp Pendleton, as well as beautiful Trestles surf beach. 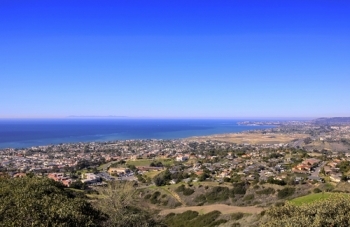 San Clemente homes are linked to the rest of Southern California by the Interstate 5 freeway. It also features several daily trains operated by Amtrak and Metrolink, which conveniently connect San Clemente with both Los Angeles to the north and San Diego to the south. It is easy to reach other areas in the region from scenic San Clemente, all while enjoying some of the most relaxing environs in Orange County. San Clemente is also a prime location for families and individuals with an interest in the arts. On the first Sunday of almost every month, the Downtown Business Association presents a Village Art Fair. This is the place for residents and visitors to stroll along and enjoy Avenida Del Mar, where more than sixty artists and vendors regularly present their art, crafts and other beautiful items for sale. There is also a fantastic Beach Concert Series each year, treating residents to various musical genres along the ocean side, as well as public holiday celebrations for Independence Day, Memorial Day, and other local festivals. Additional organizations for the beautification of and service to the community abound in San Clemente, such as the San Clemente Garden Club and the Community Center. In addition to SCHS and the standard public school curriculum, there is also one "virtual" public K-12 school known as Capistrano Connections Academy. This forward-thinking institution provides educational opportunities with flexible hours for students. Between the two high schools, SCHS (six championships) and Capistrano Connections Academy (one championship) have won the last seven national championships for the National Scholastic Surfing Association. In addition to the public educational options, there are several private schools available to the students of San Clemente. These include Our Savior's Lutheran School, a href="http://www.gotosma.com/" rel="nofollow">St. Michael's Academy, and Our Lady of Fatima School. Of course, it stands to reason that San Clemente residents who are interested in surfing will find themselves in the perfect place! Surfers can catch ocean swells all year long at popular beaches such as Trestles, Old Man's, and T-Street. Thanks to the subtle differences in geography at each point along the coastline, every spot features waves that break differently from the next. San Clemente is even the home to many surfing magazines and other related industries, such as world-renowned surfboard manufacturers. However, even if surfing isn't your passion, the beaches of San Clemente make it possible for residents to simply relax on the beautiful and sunny ocean shores, or enjoy a leisurely stroll down pleasant Avenida Del Mar. Along this beautiful street you will discover an assortment of restaurants, specialty shops, and hip boutiques, all of which are within easy walking distance of the San Clemente Pier. This scenic pier is surrounded by outdoor cafes, bistros, and gorgeous hotels. It has continued to draw sightseers, locals, and fishermen ever since it was built in 1928. After dark, downtown San Clemente hosts a variety of lounges, upscale bars, and other locations to entertain the night owl. 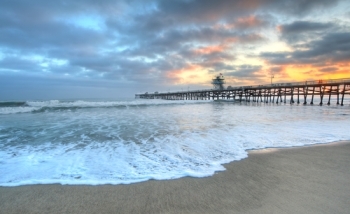 In addition to surfing, numerous sporting events are available for residents of San Clemente. The City of San Clemente Recreation Division teams up with other organizations to provide track and field events, surf and skate contests, and other physical activities in addition to the traditional sports of baseball, softball, soccer, and other pastimes. The medical care in San Clemente is excellent for a smaller city. The San Clemente Hospital and Medical Center has provided care to southern Orange County for more than 25 years. The Medical Center provides a forward-thinking focus on health promotion within the community, and expands its services according to the needs of the San Clemente residents it serves. The hospital has a stated mission to provide high quality, personalized health care and do so in a cost-effective manner. San Clemente Hospital has been awarded "Accreditation with Commendation" status, which is the highest form of accreditation possible for a hospital to receive, related to its excellence in providing patient care. When you call San Clemente your home, there is never a shortage of breathtaking viewpoints perfect for watching the sun paint the sky as it sinks below the horizon. The San Clemente home experts at The Aaronson Group will connect you with the best San Clemente property opportunities. Call 949-388-5194 or contact us online to get started!